On November 20-22, 2013, Vienna hosted the IX Assembly of the World Conference of Religions for Peace held on the theme ‘Welcoming the Other: Action for Human Dignity, Citizenship and Shared Well-being.’ Taking part in the Conference were over six hundred followers of Christianity, Islam, Judaism, Hinduism, Buddhism, and other religions. In their deliberations they focused on inter-religious dialogue and mutual respect, protection of children and women from violence and hunger, development of the experience of peaceful coexistence of different religious communities and the settlement of conflicts. A delegation of the Russian Orthodox Church took part in the Assembly with the blessing of His Holiness Patriarch Kirill of Moscow and All Russia. The delegation consisted of archimandrite Philaret (Bulekov), vice-chairman of the Department for External Church Relations (DECR) – head of the delegation; Rev. Roman Bogdasarov, acting vice-chairman of the Department for Church-Society Relations and head of the secretariat of the Interreligious Council of Russia; and Rev. Dimitry Safonov, head of the DECR sector of interreligious contacts. Other Local Orthodox Churches were represented by Archbishop Anastasios, Primate of the Orthodox Church of Albania; Metropolitan Emmanuel of France from the Ecumenical Patriarchate; and Bishop John of Thermopiles from the Orthodox Church of Greece. On November 21, the Assembly began its work with the minute of silence for Metropolitan Gregorios Yohanna Ibrahim of Aleppo and Metropolitan Paul Yazigi abducted in Syria on April 22, 2013. Archpriest Samuel Gümüs, a special representative of Patriarch Mar Ignatius Zakka I Iwas of the Syriac Orthodox Church, asked the participants to do anything possible for their soonest release. That same day a special session was held together with the UN Refugee Agency. 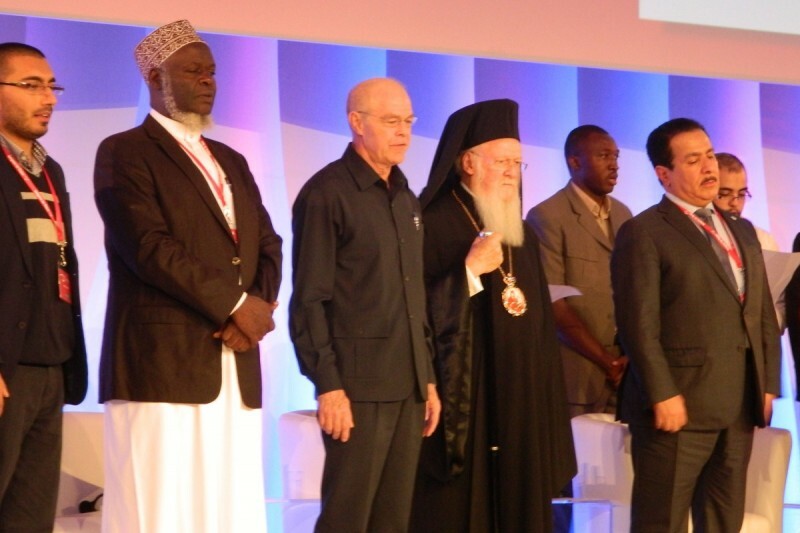 A declaration ‘Welcoming the Other: Statement of Religious Leaders’ was adopted. At the closing session on November 22, His Holiness Patriarch Bartholomew of Constantinople addressed the Assembly. The Vienna Declaration was adopted on behalf of the Assembly with major topics: overcoming of hatred of representatives of religious communities to one another; appeal to the establishment of peace in the areas of civil confrontation, and openness to interreligious dialogue.